Born 2 July 1821 near Amherst, Nova Scotia; died 30 October 1915 in Bexleyheath (London), England. 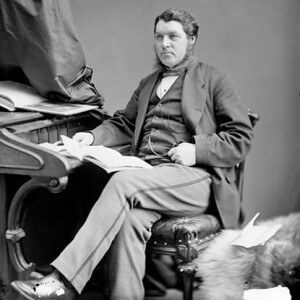 Charles Tupper, a medical doctor by training and trade, began his political career by taking a seat in the Nova Scotia Assembly in 1855, defeating Joseph Howe in Cumberland county, and becoming provincial secretary two years later when the Conservatives took power under James William Johnstone. A strong supporter of railway development, Tupper opened discussions with Canada and New Brunswick in 1857 for the construction of an intercolonial railway, although these early efforts did not meet with success. Defeated in 1858, the Conservatives returned to power in June 1863, Tupper becoming leader in May 1864 when Johnstone retired with a judgeship. Speaking in 1860 on "The Political Condition of British North America," Tupper had declared his support for a Union of the Provinces. Tupper believed Confederation would secure opportunities for economic development, but more importantly obtain a status for the Maritime Provinces as part of a greater power which they could not attain alone. In March 1864, still believing a union with Canada was far off, Tupper pushed a resolution in favour of Maritime Union through the Nova Scotia legislature, leading to the Charlottetown Conference of September 1864. When the Canadian delegates arrived with their offer of Confederation, it was readily accepted. Tupper led the Nova Scotia delegation to the Quebec Conference. Facing opposition to Confederation and Tilley's defeat in New Brunswick, Tupper held off asking the Nova Scotia legislature to approve Confederation until 1866. Even then, Tupper had to promise improvements to the terms agreed at Quebec, although the final terms agreed in London were not significantly changed, including the financial subsidy to the new provincial government. When John A. Macdonald faced difficulties balancing regions and interests in the first Canadian federal government, in a selfless act Tupper gave up his own claim to a seat, persuading Thomas D'Arcy McGee to also step aside, in favour of an Irish Catholic of Nova Scotia. When a movement to repeal the Union broke out shortly after Confederation, Tupper played an important role persuading Joseph Howe, leader of the repeal movement, to accept better terms and join the federal cabinet, even offering to resign his seat in favour of his onetime opponent. For more on Tupper refer to the Dictionary of Canadian Biography.